A Southern-style recipe for country fried pork chops with velvety homemade pan gravy. Once again I find myself typing out a recipe for something I never thought y’all would want but based on the response on the Facebook page last night, it seems you might! Me: Nobody wants these basic recipes. Me: No they don’t. If they need help making gravy, they’ll ask their mama or pull out their trusty Good Housekeeping cookbook and look it up there. Me: Not everybody has a trusty Good Housekeeping cookbook. Or a mama. You’re so insensitive. GOSH. Me: OMG, you're so right. I love Mom so much. I’m going to cry. Me: See? Insensitive. You didn't think anybody needed a recipe for Chocolate Delight or Pork Chop Casserole either but look how everyone responded to those. Me: Yeah, but don’t people want fancy-schmancy recipes with unique ingredients and fascinating back-stories? Me: Um, sure. And that’s what Ina Garten’s for. You. Are. Not. Ina. Garten. Me: You don’t have to say it like that. I’m kinda like Ina Garten. Of the South. If the South had the Hamptons, I’d totally be its Ina Garten. So… here’s my recipe for fried pork chops and gravy. And a little insight to my budding schizophrenic issues. Pour enough vegetable oil in a large frying pan to coat the bottom (about an 1/8 of an inch deep). Heat oil on medium-high heat until hot. Add flour (all-purpose or self rising can be used) to a pie plate or other deep-sided dish; set aside. Season pork chops liberally with salt and pepper then dredge in flour. Shake all excess flour off of each chop. Set flour aside. I know it seems odd to use only salt and pepper but, when it comes to these old-school country recipes, I really just like to stick to the basics. I seriously doubt Nanny was throwing around the garlic or oregano back in her day when frying up pork chops. Cook chops (in batches – do not overcrowd the pan) in hot oil until golden brown on each side. Try not to flip the chops before they have browned or some of the breading could stick to the pan. Once all the chops have been cooked, set aside and keep warm until ready to serve. Pour off all but 1/4 cup of pan drippings leaving all the bits of goodness in the pan (I usually just eyeball this but if you’re unsure, simply pour off all the oil in the pan then measure 1/4 cup and add back to the pan. Of the remaining flour used to coat the chops, measure 1/4 cup and add to the hot oil. Whisk the flour and oil together and cook over medium-high heat for 3-4 minutes or until medium brown. Add 3 cups of water to pan and whisk constantly until smooth and well combined with the roux. Reduce heat to medium-low, add salt and pepper to taste, and cook for 1-2 minutes. Add more water until desired consistency is reached. 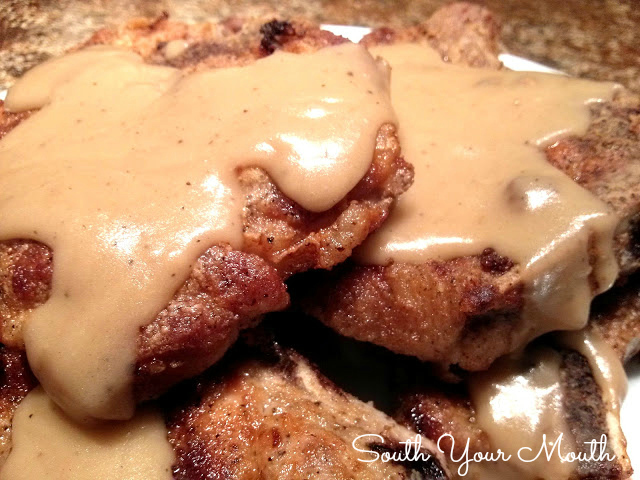 Serve gravy with pork chops and white rice (see Perfect Rice Every Time) or mashed potatoes. You are hilarious!! Or have Mommas that are on a health kick and don't want to give recipes that has any flavors! Well I appreciate your recipes and I say, "keep them coming!!" Thanks, Jada! I don't fry often but LORD it's good every now and again! Oh this sounds great! I can never make fried chops turn out correctly. I get the 1st side all nice and brown but by the time it is the top side is all flooded with meat juices and the flour basically washes away. Once I flip it over to cook the other side the darn things stick something awful and all the breading either dissolves or just refuses to leave the pan. I've tried non-stick and well seasoned cast-iron. Ahhhhhhhhhhhhhhhhhhhhhhhh, one day maybe, one day I shall figure it out. Oh, bless your heart! I've had some dud batches too over the years. The only things I could tell you are to a) make sure you just barely dust those suckers with flour b) make sure you don't have too much oil in the pan (you don't want it higher than halfway up the sides of the chops) and also c) to not cook them at too hot of a temperature. Keep trying, it'll all come together one of these days. And until then, just serve them ugly-side down! I put my chops in an egg wash then in the flour then back in the wash then flour again and I always have enough oil to cover them completely, like a deep fryer. They never stick to the bottom and the crust dosen't fall off. I can't think of any recipes I love more than those that involve meat and gravy! Hi Lisa! I'm a little late responding to this but I would LOVE to share next time! I just 'liked' you on FB so hopefully I'll catch it the next time around. Thanks for stopping by! And Fried Apples and Biscuits! I, for one, am really glad that you don't have weird ingredients!! Heck, I can barely get my family to eat anything with a regular veggie in it, much less some kind of odd thing that I can't even find at the regular grocery store!! Keep up the great work girlfriend!! This is how we fry our pork!! Salt and pepper!! But for the gravy we use milk! Served with mashed potatoes! Yum!! Love this, but will be using pork steak instead of chops. Ive always made my gravy this way, but i have added milk to get the consistency i want- i will be trying it w/o milk!! Thanks for this site - i love the old fashioned recipes too!! My 3yr old and I just made these the other nite...He loves to help in the kitchen and is a picky eater so it helps him eat better. He did the breading of the chops all by himself! We love pork chops and use the boneless ones I think ppl. over cook the pork to the point of dryness. How do they avoid this? I hate dry chops. So I use a thermometer and make sure they are at exactly 160°. They are cooked but still nice and juicy. Sometimes people think chops have to be well done but they dont. You can cook them medium and not worry about getting sick or anything. Its nice to see a gravy recipe like I grew up with. The only difference is that when my family makes gravy, we use half water and half milk, instead of all water. I love basic seasoning -- and plenty of it -- on chops, too. But while this might be considered a horror, have you ever replaced some of that water with wine ... ? I haven't used wine with "country" recipes like this but I use it when I'm making a pan reduction sometimes. The name is Pooch. I don't have all the stuff they want to register. Okay, this is me. S&P only. Don't like the other spices. You got a good piece of meat, why cover up the flavor. One question: Does your gravy tastes like pork chops or just regular water/milk gravy? It seems I could never get the meat flavor in the gravy and yes, I did leave all those bits and pieces. Don't know where I go wrong,. I make good gravy for biscuits, just can't seem to pick up the meat flavor for steak, pork chops or chicken. Help! The longer you cook your roux in the pan drippings, the more flavor you get but the best way to get the "meat flavor" is to use stock or broth instead of plain water. Any time I roast, simmer, etc. pork, I freeze any leftover stock to use when I make gravy. And then I just use canned beef of chicken broth when I'm making those types of gravy. I always make the gravy with whole milk instead of water, and use a buttermilk wash on the chops before the flour. It all works really well. I also season the flour with garlic salt, ground pepper, and a little paprika before applying it to the chops. The flavor is amazing. I learned to do this from our ranch foreman's wife in the early 60's, and was she ever a good cook!! We had fried pork chops, biscuits, & gravy for breakfast before we went out to gather cattle at about 5:00 AM... it would definitely stick to our ribs! Looks delish ! Now i'm hungry for some, lol. Love your site & the name SYM. Keep'em coming. Just found your blog and i just have to say...as a transplanted Southern girl living in (overly healthy) Northern California.....I love you!!! and thank you soooooo much for bringing GOOD DAMN food back to my families' table! You are cooking the food I grew up with! You and my mom do pork chops the same way, however, the only difference is she always did cream gravy. ( Heavenly stuff--I could almost bathe in it!) It was a huge shock to me to realize that the foods I grew up with in rural Illinois were so very southern. I asked my mom about it a while back and her response was that it was "farm food" and that farmers were everywhere. Keep on doing what you do! That gravy recipe wasn't working at all. I followed it and tried it twice and it tasted more like corn starch ball than anything. Was super bummed it wasn't good enough to go on my tasty chops. OMG! Reading your recipes are like reliving my childhood!! This is the food I grew up on. Made my kids Fried Pork Chops, gravy and white rice a couple of months ago and they thought they'd died and gone to heaven! This is how my Mama and my Gramma made pork chops that I grew up on, dreamed of, and proudly feed my large family. Only difference is that my Mama and Gramma used half milk half water in the gravy (that Papa liked so thick you had to spread it with a spoon!) and I use just whole milk. Keep the recipes you think nobody wants coming, these are the types of dinners I am raising my family on, and teaching my kids to cook. Nobody cooks like Mama and Gramma anymore! Enjoy the basic old fashion recipes, I have many from my grandmothers and grannys, so basic and everyone loves them. Glad to see salt, pepper, and flour without adding everything in the kitchen, I am with you, people put way to many extras and it ruins the taste. Nice simple traditional recipe which makes it nearly fool-proof. The only thing I did differently when I made these last night was put a pinch of sage in the dredge because that's what my mom always did. I also use either chicken stock or 1/2 milk/stock when I make the gravy. My West Virginia born & raised mom was a great cook and that's how she did it. Keep up the good work! Similar,but i flour,then dip in a milk-n-egg wash,then flour again.......makes an awesome crust. I make gravy the same, except use evaporated milk and water...more water than evap...probably a 2 to 1 ratio. I usually use a whole can of evaporated milk, and 24 oz. of water. I use about a half cup flour to the left over grease. If it's too thick, I add more water, and a little whole milk (instead of opening more evaporated milk). Some of our Mamas died back in 1963 and some of our older sisters made off with the Good Housekeeping cook book before we were tall enough to reach it so keep putting out your recipes cause some of us are still serving dry pork chops and bloody fried chicken and we need you! (Not to mention you add some laughter to our misery when our long-suffering husband asks if we think if McDonald's might still be open.) So drop that Thorazine! We need your brand of schizophrenia! This recipe looks good! All my love. help please.. getting ready to cook this for husbands b day tonight not familiar with cooking as most.. how much roux do I use I know this is a basic question,but any help would be so appreciated thank you! The 1/4 cups of pan drippings and flour make the roux. Good luck! thank you.. i realized after re reading ..great recipe thank you! turned out great thank you!! !